What did a 2007 experiment with wine show about the way people make decisions? In a 2007 experiment by Hilke Plassman and colleagues, subjects were invited to participate in a wine tasting while sitting in an fMRI scanner. Three bottles of wine were poured into five different bottles, giving the impression that all five bottles contained different wines. The bottles’ original labels were removed and replaced with new price tags. Even though some bottles with different prices actually contained the same wine, subjects clearly preferred the most expensive wine. Moreover, the pre-frontal cortex was the area of the brain that most strongly responded to the price tag. This suggests that our prefrontal cortex is involved in evaluating our experiences according to what we think should be important regardless of what we actually feel. In this way, if we rely too much on our intel lect when making decisions, we might focus on the wrong features. A balance between thought and emotion is necessary for effective decisionmaking. Do we judge wine based on the price tag? 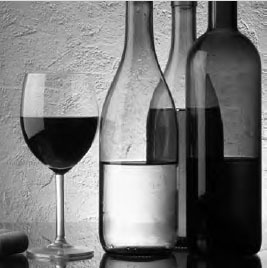 One study says we do, believing that a costlier wine must be better than a cheaper wine, even if the same wine is put in both bottles (iStock).